Motorcycles are everywhere, but who made the bumper sticker? Variants of the yellow "Motorcycles are Everywhere" label have been around since 1982. "Motorcycles are Everywhere." That's what those ubiquitous yellow bumper stickers (and signs) say. This spring, it's especially true. Long stretches of nice early weather brought out motorcyclists in droves, starting in late March. It's the opposite of last spring when there was little nice weather and a lot of motorcyclists didn't get riding until July. "There are more bikes out on the road early this spring," said Tim Smith, who has operated Seacoast Cycles in Newburyport since 1989. "The nice weather definitely has brought a lot of riders out. That doesn't mean we won't have the usual last-minute rush for stickers before the May 31 deadline though." The early start to the riding season has motorcyclists thinking safety, which brings us back to those yellow signs and bumper stickers, which also warn "Check twice — save a life." 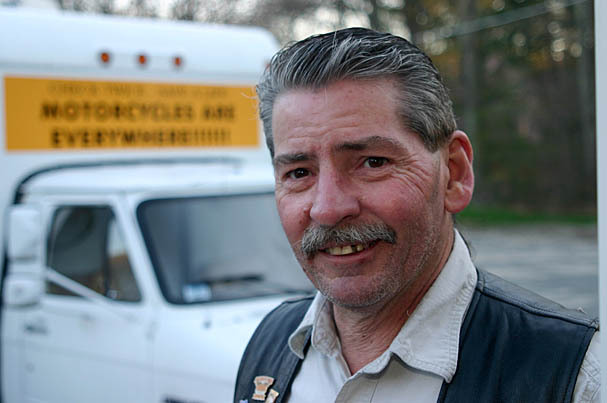 Paul Cote, a motorcyle safety advocate, may as well be the Massachusetts bikersâ€™ best friend. They were the creation of Bob Doiron, then of Somerville, in 1982. He was one of the founders of what is now the Massachusetts Motorcycle Association (MMA). Now retired and living in Moultonborough, N.H., Doiron transferred rights to the signs/stickers to motorcycle activist Paul Cote of Amesbury. Cote is the Massachusetts bikers' best friend, an irrepressible spokesman who lobbies for safety and fair insurance rates for riders and against proposed restrictive legislation. There were 182,215 motorcycles registered in the state as of last September. The number sounds impressive until you realize there are 4.3 million cars on the state's roads. Those numbers make it easy for bikers to get overlooked on one hand (safety programs, insurance rates) and singled out on the other hand (restrictions on noise, passengers, and equipment). Where most states designate May as a motorcycle safety awareness month, the MMA has successfully argued that the last week in March and all of April be designated in Massachusetts, and a law enacted in 2002 calls for the governor to issue an annual Motorcycle Safety Awareness proclamation. "Plus we continue to support all those May programs, too," says Cote. "We've already had three fatalities this spring (as of April 8). That scares me," says Cote, who annually reviews accident reconstruction reports and state data provided by the Registry of Motor Vehicles to offer suggestions on following years' safety messages. Cote monitors government agencies, being the voice that cries, "What about us?" Why does he do it? "Everyone has a flicker of that flame inside them, but life tries to extinguish it. There are times when you have to make the decision to either live on your knees or die standing up. When I find things worth fighting about, I try to rally people," says Cote. "I know that if you work the system, the system will work. But sometimes you've got to light a fire." "The Registry of Motor Vehicles is in charge of safety and training," says Cote. "Two dollars from every motorcycle registration is supposed to go into that fund, but it's subject to legislative appropriation." Cote urges cyclists to look at their insurance policies and make sure they're sufficiently covered in Parts 3 (Bodily Injury Caused By An Uninsured Auto), 5 (Optional Bodily Injury to Others), and 12 (Bodily Injury Caused By An Underinsured Auto). "Everyone wants lots of insurance after the accident," he says. "Because when that accident happens, it's usually not good. It only costs about $40 to carry an extra $100,000 of coverage." Cote, Alan Kline of Lynn, and Betsy Lister of Medford, have testified at insurance rate hearings since 2001, questioning excessive rates insurers charged riders. Cote's research found that in 2004 the insurance industry took in $48 million in motorcycle premiums and spent less than $24 million in claims, expenses, commissions, and other costs. "That's 100 percent profit," he says. In 2007 and 2008, Plymouth Rock Assurance gave the MMA a total of $29,000 in safety grants to fund sign placement. "Roughly two thirds of the state's 353 cities and towns gave us permission to place signs and banners that first year," said Cote. "The Plymouth Rock people said it was one of the most effective campaigns, dollar for dollar, they'd ever had. If those signs saved just one life and claim, they more than paid for themselves." You are making a left turn in front of a rider. A motorcyclist is riding in your blind spot. There are hazardous road conditions. Potholes, wet leaves, railroad tracks, and other obstructions may force a motorcyclist to take an action you don't expect. You have an obstructed line of sight. Sport utility vehicles, delivery vans, and large trucks may block motorcyclists from your view.